A UPS is an uninterruptible power supply. It is a device which maintains a continuous supply of electrical power, even in the event of failure of the mains (utility) supply. A UPS is installed between the mains supply and the equipment to be protected. 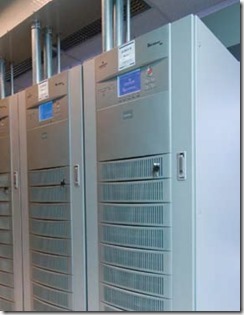 UPS are used to safeguard various types of equipment. One of the common uses is computers, particularly in data centres and the critical equipment of large organizations. A UPS works by converting the mains alternating current (a.c.) supply to a direct current (d.c.) voltage. The part of the UPS which does this is called the rectifier. Output from the rectifier is then used to charge batteries, which can supply power during a mains failure. The d.c. voltage from the rectifier (or batteries during mains failure) is the converted back to a.c. by the UPS inverter and supplies power to the equipment. Note: the above UPS description is that of a static (electronic) UPS. While this is the most common type of UPS, there are other technologies, for example, rotary UPS and the use of flywheels to store the energy. In addition to protecting equipment in the event of mains failure, because the first convert the a.c. to d.c, a UPS has the added benefit of being able to solve other problems related to power supply quality. These include voltage dips, harmonics, frequency variations, etc. For more information, you can see the note 9 power supply issues solved by using a UPS. UPS units and systems come in various sizes, from 1 or 2 kVA all they way to the MVA range. On of the problems and limiting factors with how large a UPS can be is the amount of batteries required. These can become substantial, costing a lot and taking up significant amounts of space. For smaller UPS the batteries are normally internal to the device, while for larger systems the batteries are mounted externally on racks or in cabinets. Another element to batteries is the discharge time. Any battery backed UPS will only be rated for a certain period (5 minutes, 15 minutes, 30 minutes, etc.). For this reason, most UPS applications are centred around providing sufficient power for a limited time to enable any necessary actions - safely shut down the equipment, change over to generator power, etc. The arrangement of rectifier, inverter, battery and other components can be carried out in different ways. Each arrangement has advantages and disadvantages. Normally the more robust the configuration, the more expensive the UPS. UPS are classified in two basic ways - standby and on-line. In a standby UPS, power is normally supplied directly from the mains and the inverter only switched in if the mains fails. This can have the advantages of cheaper cost and higher efficiencies. On-line UPS always supply the load via the inverter. These are more expensive, but because the inverter is always used they can resolve many power quality issues. In a standby UPS, the static (electronic) transfer switch supplies the load directly with mains power. In the event of power failure, the static transfer switch immediately changes over to power from the inverter. Static transfer switches when switching from mains to inverter power, will typically do this in less than 5 mS. The battery is always kept at full charge by the rectifier and immediately available for supplying power. Often a filter provides some power conditioning when supply mains power to the load. A surge arrestor protects the UPS and loads from over voltage conditions. In on-line mode, the load is always supplied via the inverter. The inverter normally takes it's input from the mains, but will switch to the battery when the mains supply goes out of tolerance. The static bypass will supply power directly from the mains in the event the inverter is turned off or develops a fault. A big advantage of on-line UPS is that the load is always supplied by the inverter and many power quality issues on the mains are eliminated. For more information, you can see the 9 power supply issues solved by using a UPS note. In addition to pure standby and on-line systems (illustrated above), UPS are available in various other arrangements. Ferro-resonant [standby] - the load is supplied by a three winding transformer, with the mains on one input winding and the inverter on the other. The transformer provides some level of Ferro-resonant power conditioning and voltage regulation. During a mains failure, the switching from mains to inverter power is by a static transfer switch. Line Interactive [on-line] - in this configuration, the load is always supplied by the inverter. There is no rectifier and the batteries are charged by running the inverter in reverse when the main power is normal. A transfer switch changes the input of the inverter from main to battery on mains failure. Delta Conversion [on-line] - is a relatively new and patented technology. This technology use converters cable of both rectification and inverting, together with a delta transformer to supply the load. Some of the mains power is directly used to supplement the load inverter output to create a better inverter efficiency.